Painless is committed to the Mustang's performance potential. 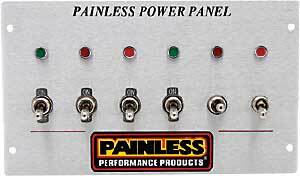 To help you get the most from your own 1979-93 Mustang, Painless offers these race-quality switch controls. Perfect for street or strip, these panels use the best switches and 18' of high-temp TXL wire for maximum durability and performance. Does Painless Performance Products 50421 fit your vehicle?